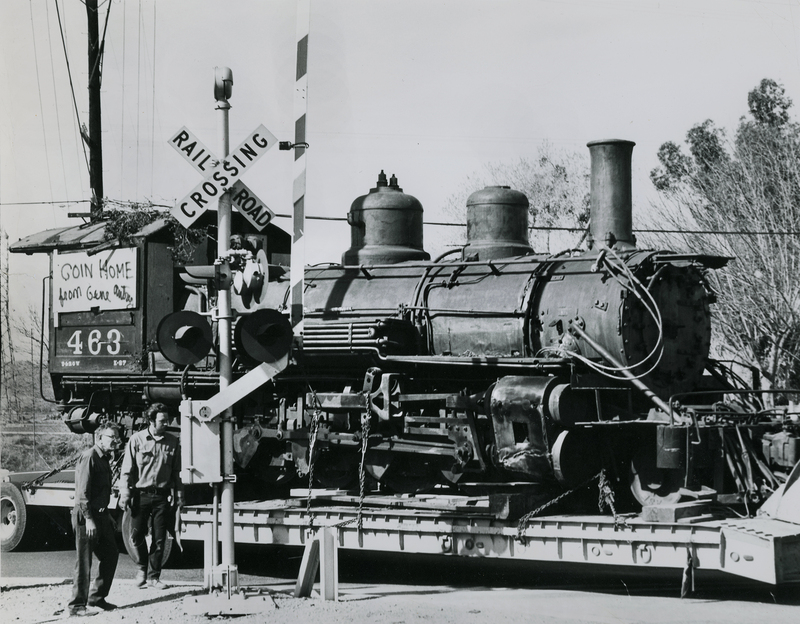 Gene Autry's Engine 463, which he acquired in 1955 and kept at Melody Ranch, is trucked through Newhall in 1972 on its way back to the Denver & Rio Grande Railroad. Known as "mudhens" because they would frequently derail on lighweight rails and scoot across the ties like a waddling hen, Engine 463 is a narrow gague (3-foot) K-27 class 2-8-2 built by Baldwin Locomotive Works in 1903 and used until 1955 on the Silverton (Southern) Branch of the Denver & Rio Grande Railroad (renamed Denver & Rio Grande Western Railroad in 1924). Engine 463 is one of only two surviving K-27s. Gene Autry purchased the locomotive in 1955 after it was retired from service and kept it at his Melody Ranch studio in Placerita Canyon, which he intended to transform into a Western museum. Engine No. 463 was used as a movie prop (as were other retired locomotives, including the Mogul Engine No. 1629, which Autry later gave to the Santa Clarita Valley Historical Society) until a 1962 wildfire devastated the property and dashed his plans. The 463 was a derelict when, in March 1972, Autry "returned" it to the town of Antonito, Colo., for the new Cumbres & Toltec Scenic Railroad, which the states of Colorado and New Mexico jointly created in 1970 when they purhcased the line between between Chama, N.M., and Antonito from the old Denver and Rio Grande Western Railroad. The town of Antonito gave Engine 463 to the Cumbres & Toltec to restore; the restoration was complete in 1994 and it began hauling tourists. Engine 463 threw a side rod in 2002 and was taken out of service. In 2009, it was moved to the railroad's shop at Chama, where it was rebuilt. It returned to service in Spring 2013. As of 2015 it is the smallest engine on the line. A tourist line that uses part of the San Joan Extension of the Denver & Rio Grande, the C and TS is still owned and administered jointly by New Mexico and Colorado. It is America's longest and highest narrow-gauge railroad and is listed on the National Register of Historic Places. It is leased to a private operator who is responsible for carrying tourists on scheduled rides and maintaining the rolling stock and the associated rail museum.